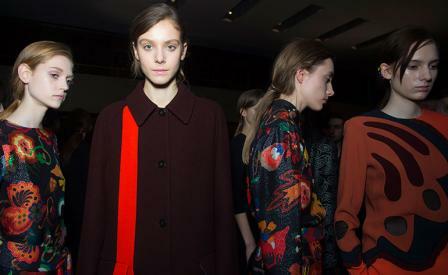 Scene setting: Paul Smith gave 1960s Grade I listed building, the Royal College of Physicians in Regent’s Park, designed by architect Sir Denys Lasdun its fashion week debut for A/W 2016. The modernist masterpiece’s floating stairwell offered a striking entry point for Smith’s models within the venue’s main foyer (dominated by the bold contrast of white marble, brass rails and mustard hued walls and carpeting), as other show goers watched the procession on a big screen in an adjoining gallery. Mood board: Working with an era sensitive palette of rust, navy, crimson and dusty pink, Smith’s woman was perfectly at home here in her architectural tailoring. Fresh accents included turquoise and mustard hued buttons that peppered his tapered pant legs or double breasted blazers, the sculptural ruffles that finished his soft blouse collars or sleeves, and charming embroideries featuring red apples chomped to the core. Finishing touches: The models’ loose ponytails, which only emphasised the sensuality of Smith’s simple sack dresses that were often missing back panels, were clasped with silver metal clips that had a wonderfully retro simplicity to them. Under foot, the designer offered up a plethora of creative spins on the traditional loafer that were both functional and feminine; jazzed up with either a patchwork of hues or flat folded bows.